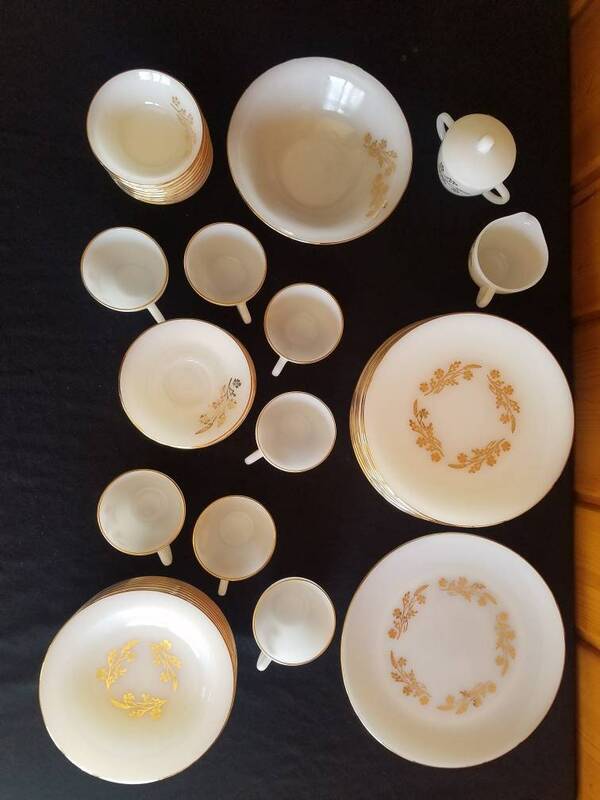 This 43 piece set of Federal Glass Meadow Gold with 22kt gold wheat and flower pattern from the 1950's An almost complete 8 piece setting, minus one coffee cup. 7 Coffee cups 2.5" tall x 3.75"
1 Salad/desert bowl 8.5" x 2.75"
They are in mostly excellent condition with no chips or cracks. The gold is mostly intact with very few spots of wear. The dishes have a wheat and flower design, and a shiny gold band. Would make a great gift for a bride or couple. Cottage, traditional, Mid-Century, shabby chic, farm house, serving pieces, home décor, gifts for her, wedding shower gift. These would be beautiful in any modern home or in a vintage setting. Shipping is set for $99 at this time. It would go out in three different boxes. We would be happy to refund any over charges with this order. It may be less depending on your location.